This is a post and a slideshow about an independent project that I took on in 2010. 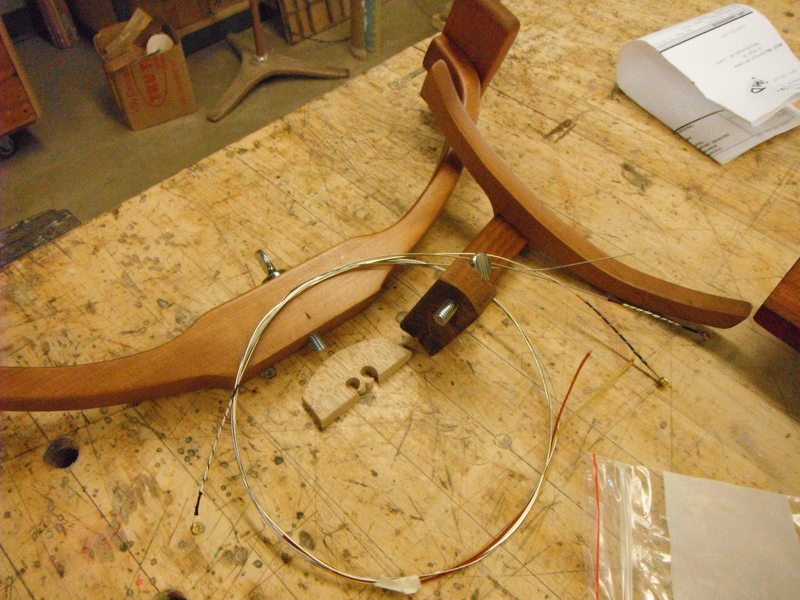 As a designer and a musician I decided, with the help of the UWSP wood shop, to build an electric cello. This is the evolution of my project, it is the pictures, the story. It was such a huge part of my year and still is something that I am passionate about. I did not use a blueprint, this thing that I created is my own design and my own motivation. I am immensely proud, and am happy to share it with you today. I have played cello for 15 years. I started playing and taking private lessons when I was in first grade. Although there were some very rough patches where I almost quit, I have managed to maintain a passion for the instrument and a passion for the music. Now, at the university I am working on a music minor and I am also involved in orchestra, quartet, sextet, cello studio, and lessons. Last year I took ART 103, which is a required 3D design class. 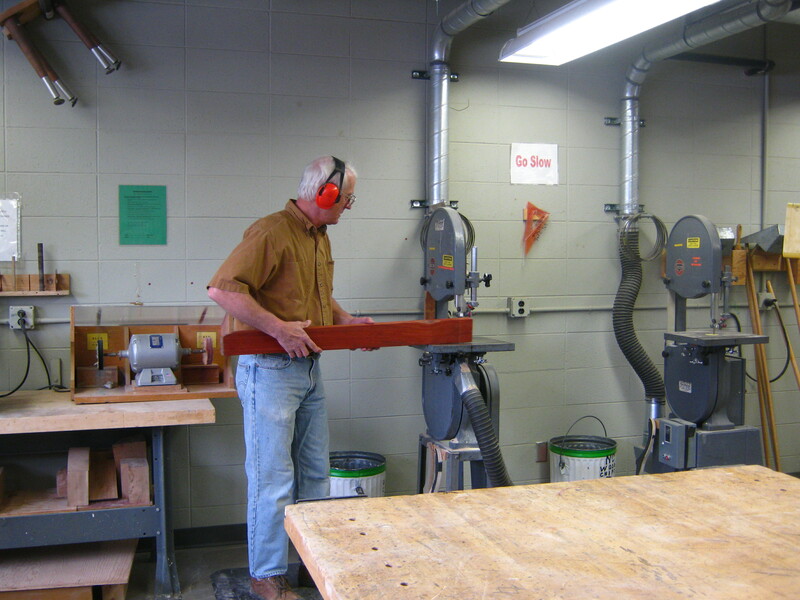 In that class I was introduced to the UWSP wood shop and to the wonderful Bill McKee, the shop supervisor. That semester I also had the opportunity to work with suzuki cello instructor Tim Mutschlecner while our usual professor was on sabbatical. It was these two things combined that provided me with the inspiration and the means to start my electric cello project! One day in studio we were having an “alternative” day. And to this studio Dr. Tim brought his electric cello, which he built himself, and told us about his process. As he went on I realized that I could do what he did. And I could do it with minimal cost! By carving and shaping the wood myself in the wood shop I eliminated the need for a professional carpenter, and by using an old pickup from my upright bass I eliminated the need to buy one. Here I will describe my own process, my success, and my failure. This project was conducted in my free minutes and hours between class and on weekends. 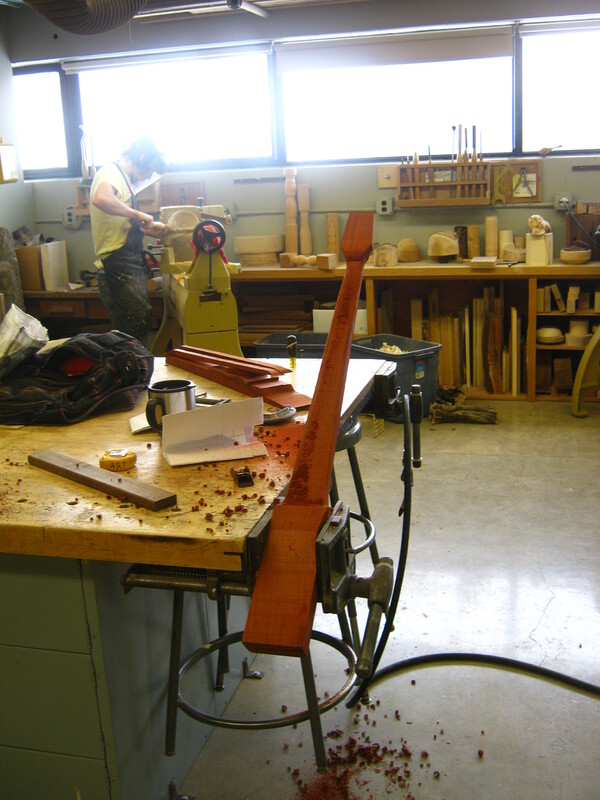 I learned insurmountable amounts about wood working and about the ergonomics of the cello itself. First I started with an idea. I talked to Dr. Tim. And I talked to Bill McKee. Luckily, Bill was on board with the project from the very start. Neither of us had ever done something like this before, but we were still pretty jazzed! Before we started I already had some requirements and ideas about how the cello would have to be constructed. I wanted it to be able to fit into the overhead compartment on an airplane (so that I could take it back and forth from NH to WI easily), I wanted to have the option of a obstruction free fingerboard, and I wanted it to be beautiful. Dr. Tim gave me a few measurements that he used, and I did a lot of measuring on my acoustic. In the end I decided on having one solid stick approx. 5″ by 42″, one detachable part for the knees, one detachable part for the chest, and one adjustable end pin. 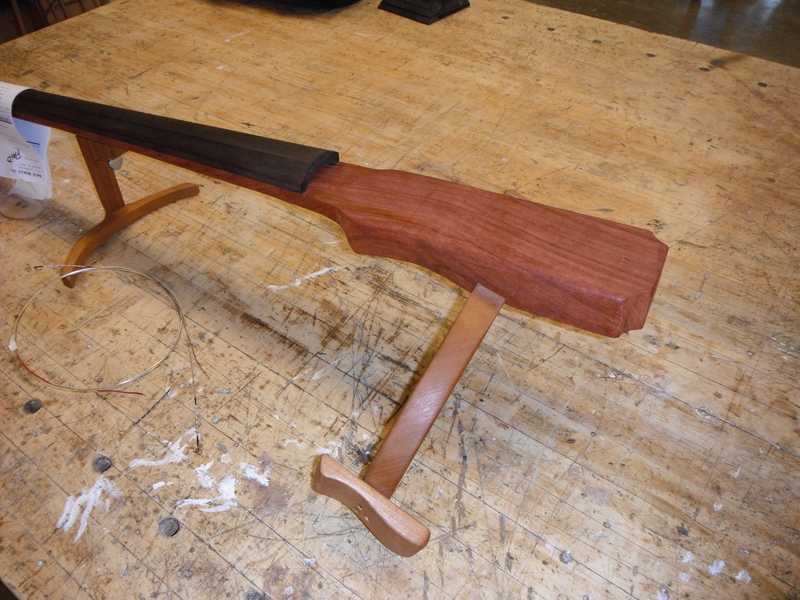 Here is Dr. Tim’s completed cello lying on the floor next to my stick of wood with a template. At this point I was simply measuring, tracing and preparing to make the first cut. 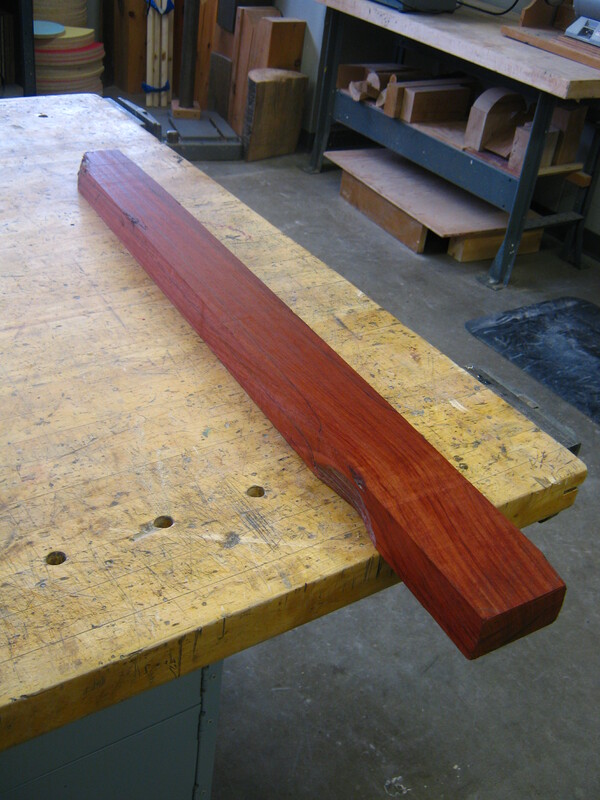 This is a beautiful piece of padauk (an African hardwood) that Bill McKee found for me. 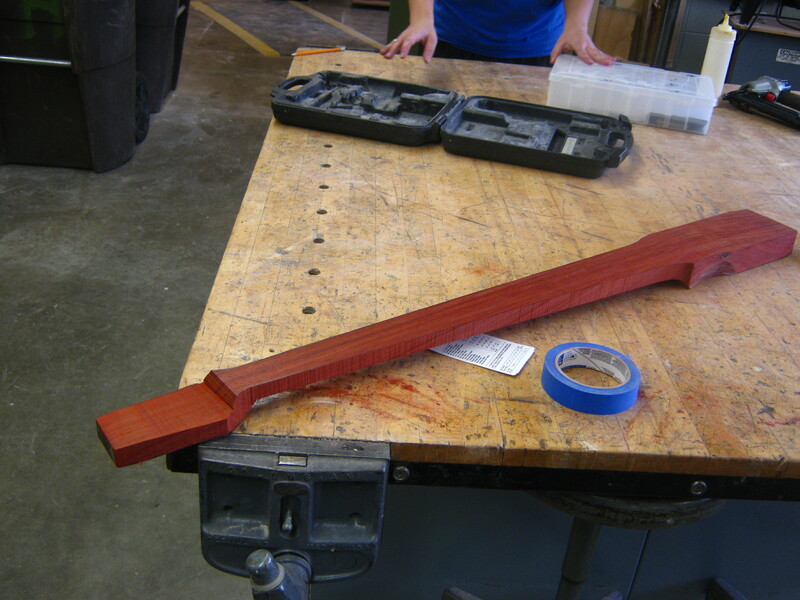 Turns out that Padauk is a very popular wood to make cabinets out of. This was found in an old carpenters shop. Once we planed it down and cleaned it up it’s deep red color was revealed. Although this is the natural color it does have the tendency to oxidize and become a little more muted and dark the more it is exposed to air. You can see my traced outline on the face of this, as well as the flaw in the wood which later turns into a lovely design detail. 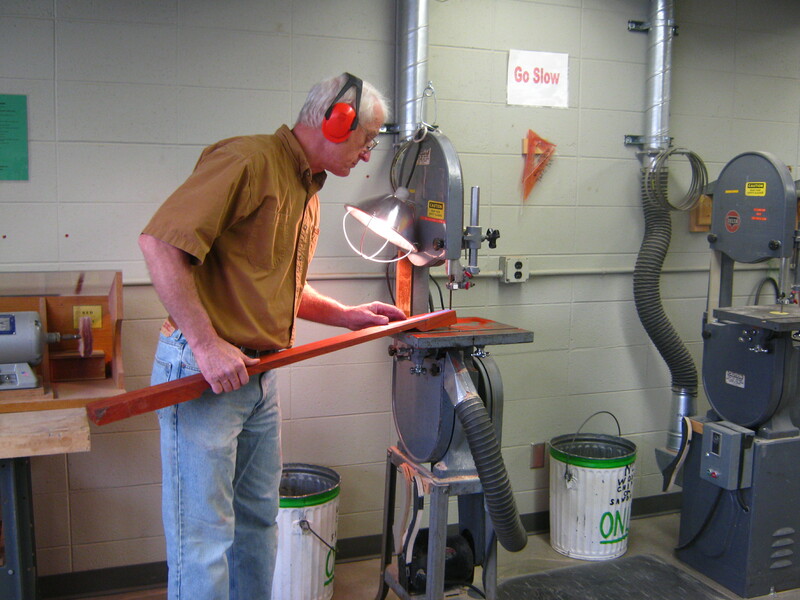 Bill making the first cut on the band saw. And here is the second cut! This is the rough stick, now given back over to my care to shape and refine. Detail of the rough head. Note the uneven plane on the top, making these planes parallel to each other was one of my goals. 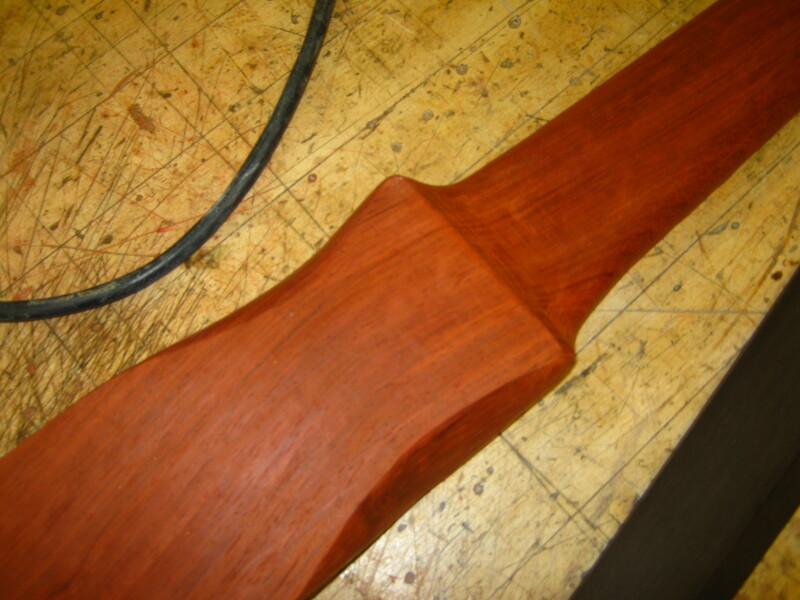 The biggest challenge of course was taking the neck turning it into an even “c” shape. 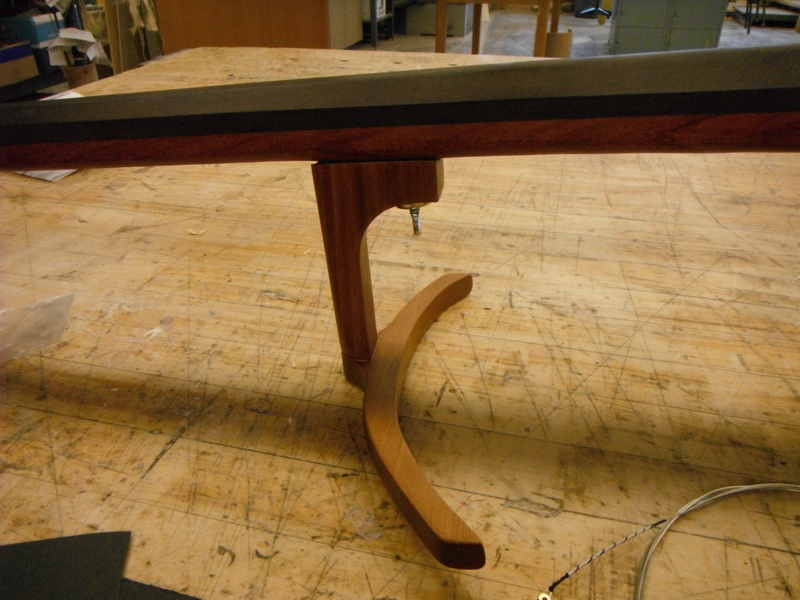 I clamped the stick onto the bench and started the shaping process. This took hours and hours. I managed to make a complete mess out of any surface within a ten foot radius of where I was working. So, lets take a look at the tools that I worked with on this project. 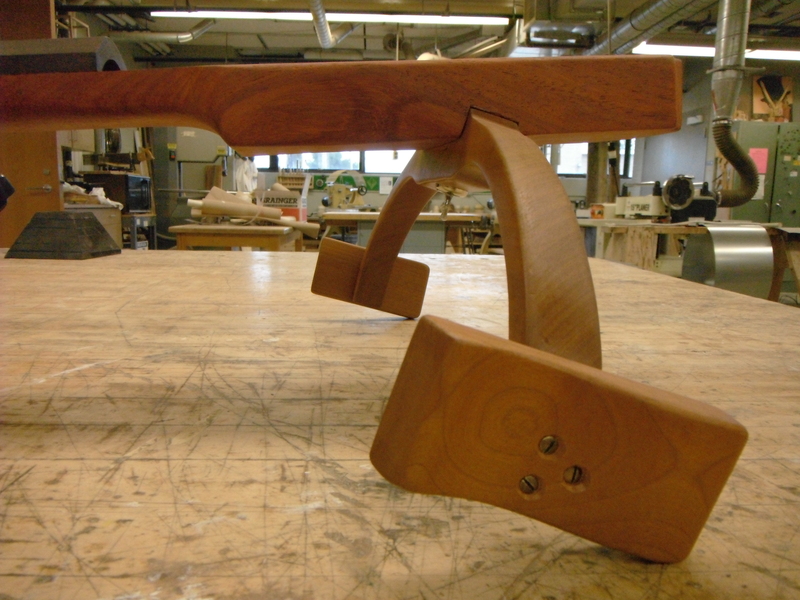 There was of course the bandsaw seen in earlier pictures. 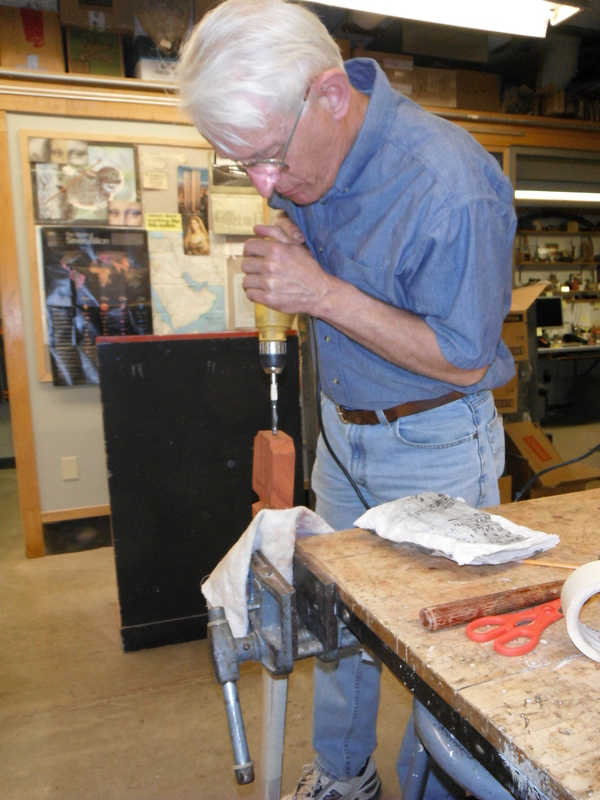 For shaping, carving, and refining I used a variety of handheld tools. 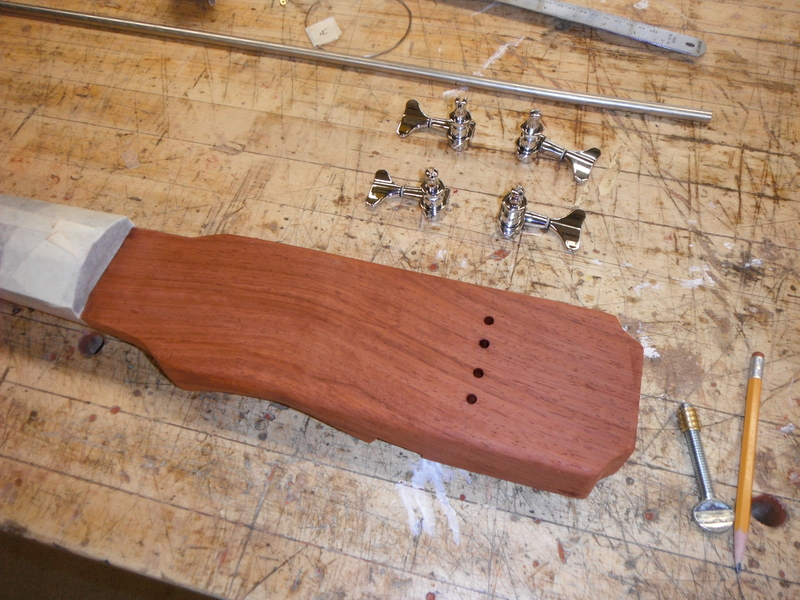 Mostly I used a small thumb plane, rasp, parallel, and lots of different grades of sand paper. The color of the sawdust was absolutely stunning. 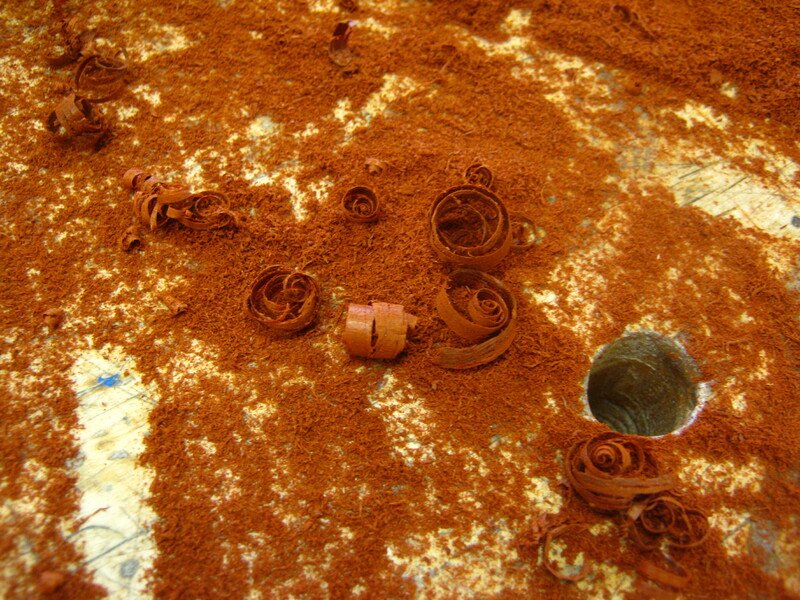 After being covered in this color for weeks Bill and I found out that when in a sawdust form padauk is slightly toxic. Oops! Carving now finished I pose with the stick. 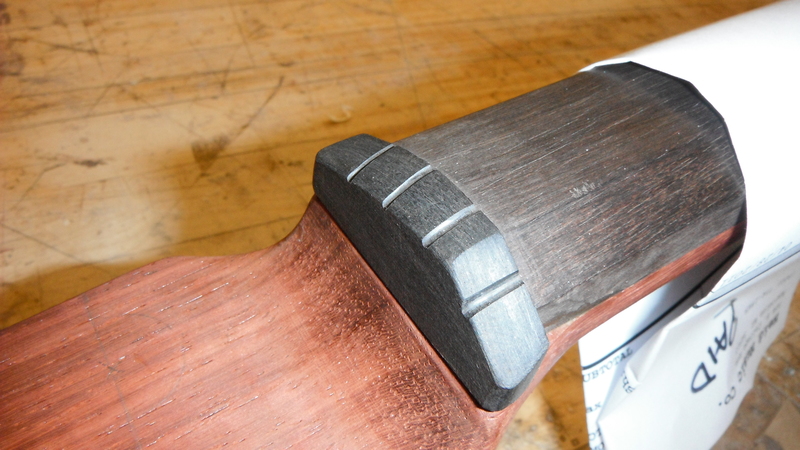 Here a detail of the backside of the stick. What was a flaw in the wood at first turned into my favorite part of the design. I ended up ordering a fingerboard from the International Violin Company. I considered making my own, but there are some very specific thing that need to be done to which I was oblivious. For example, the middle part of the fingerboard is actually concave. This prevents buzzing produced from the vibrating string! Very surprising. For this I needed a luthier, it wasn’t something I would be able duplicate. This is the unglued fingerboard sitting next to my stick. Refined head. The tape and string was because a huge splinter came off of the top and we had to glue it back on, and make sure that the bond was really tight. Because I couldn’t clamp it I wrapped it really well with string! Very unfortunately my camera died for a period of time in which some very important changed were made. Most prominently is the creation process behind the chest piece and the knee piece. To create these there was A LOT of trial and error. 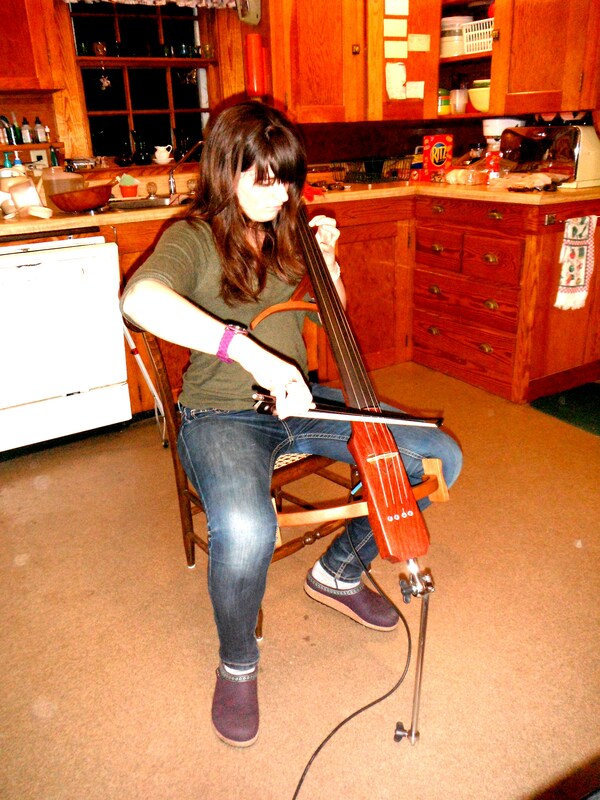 I would make something out of plywood and then tape it onto the stick and sit, pretending like it was a real cello. I did this until I found the perfect size. What threw a wrench into this plan was the realization that this really needed to be at an angle. Like a fool I didn’t reevaluate the length that was compromised in tilting the wood, the result is a beautiful knee piece that still doesn’t work exactly how I would like it to work. What happens is that the bow hits your knees on the severe up or the severe down. Although not optimal, after practicing for a little while it is something that becomes less of an issue. The chest piece was very easy. I simply imitated the curve of the acoustic cello, and used the actual depth of my acoustic. 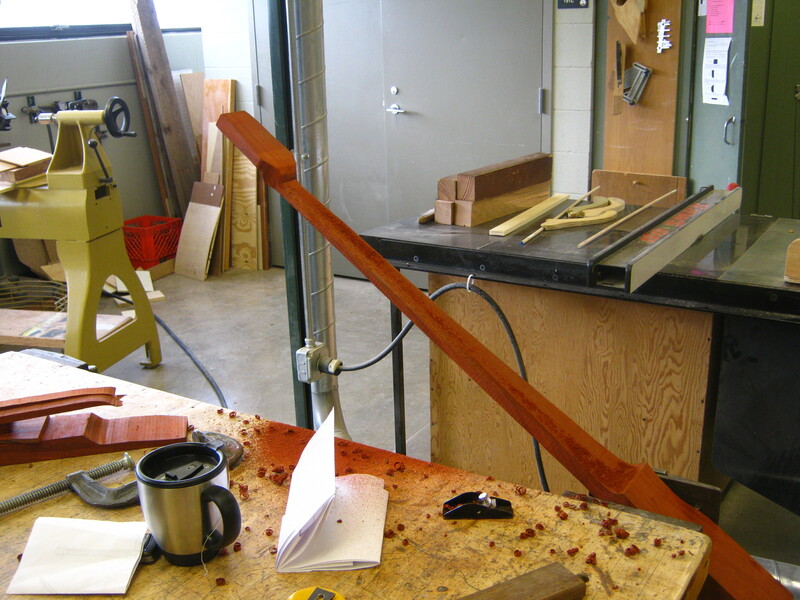 The wood is a mix of cherry and ipe. On the right is the knee piece, and on the left is the chest piece. 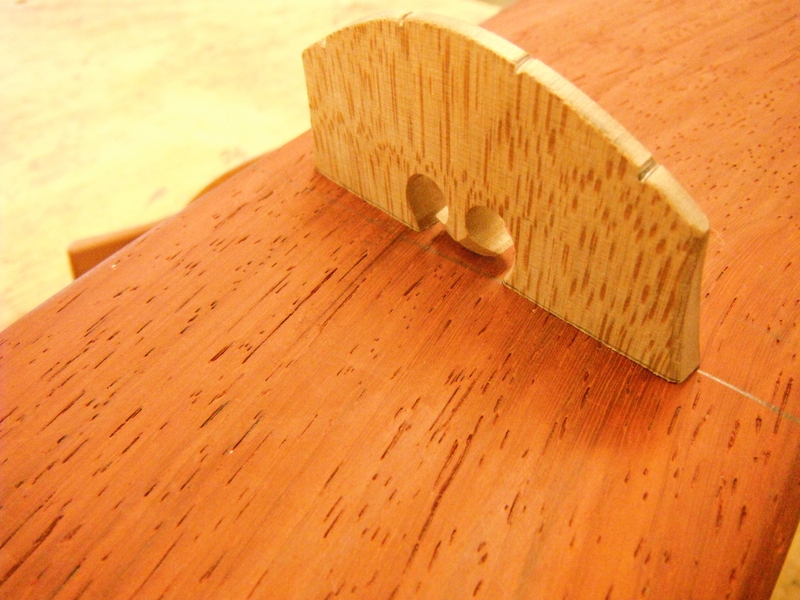 You can also see the new bridge, which was shaped for me by a luthier. It is made out of beech. 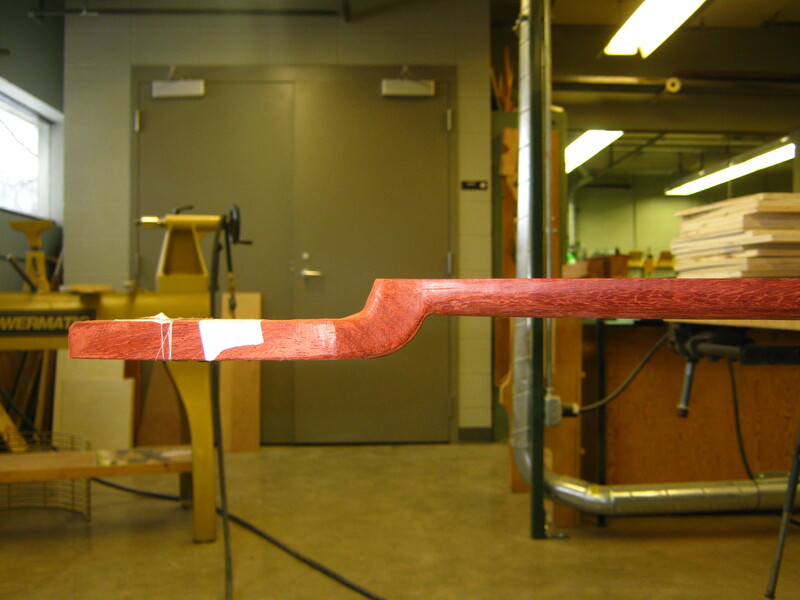 When we were gluing the fingerboard onto the stick it was quite a sight. 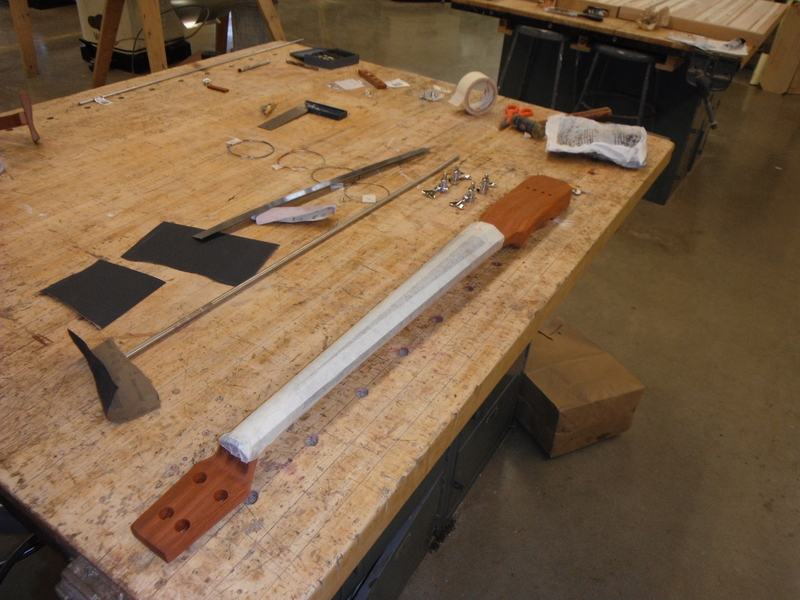 In order to get a consistent and solid glue bond we used probably twenty clamps and left it sitting as franken-cello for a couple days. This is how the chest piece interacts with the stick. It is molded and anchored so that it doesn’t shift or adjust while you play, in this sense it is exactly like an acoustic cello. There is an inset screw to secure the chest piece to the stick, and the small hole to left of it is for a metal anchor that keeps the piece from shifting. Close up of the final chest piece! 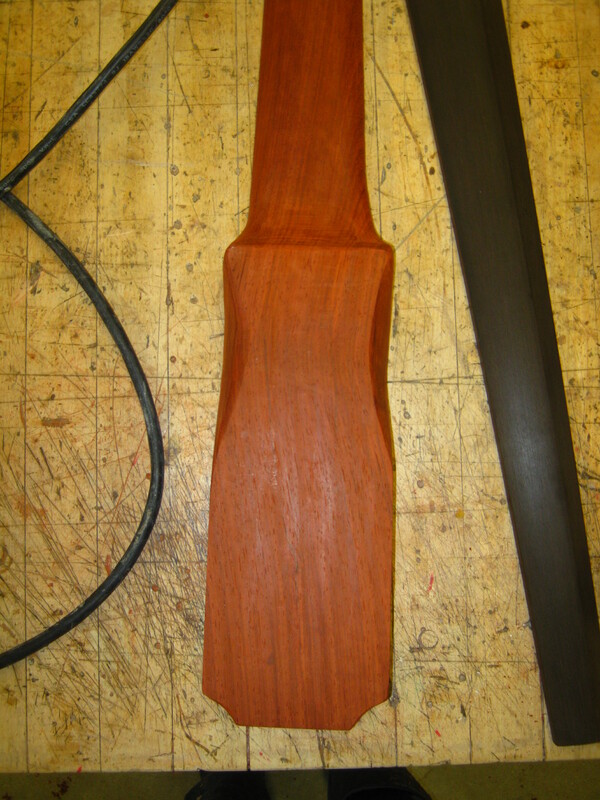 The larger curved part is cherry, and the base is ipe. 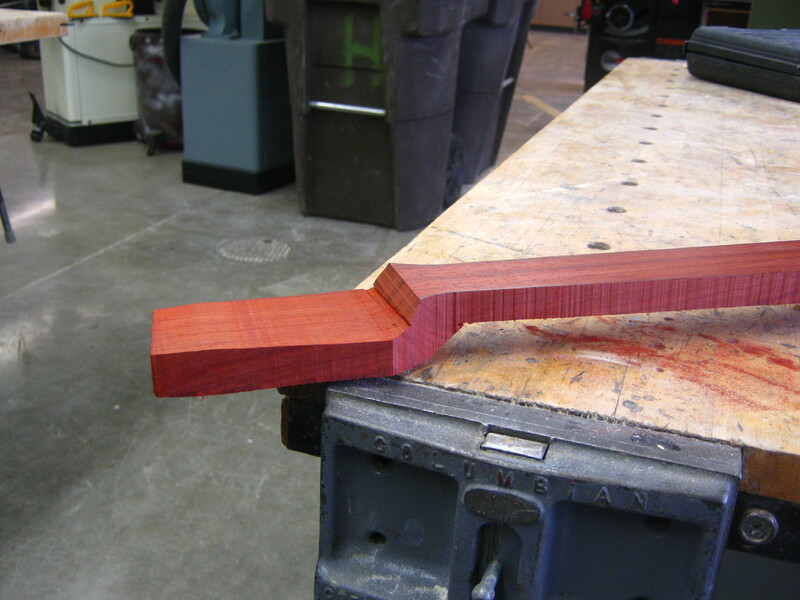 Mitered cut and inset screw for the knee piece. 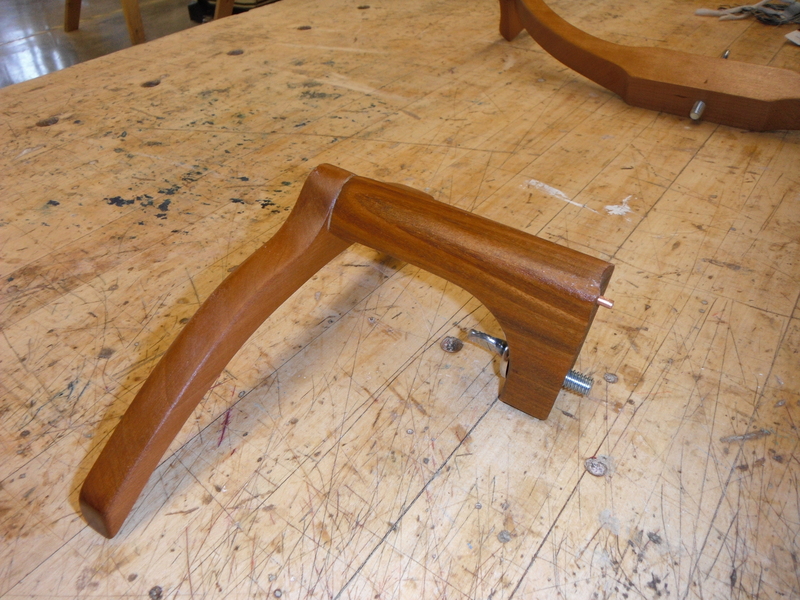 Knee piece attached to the stick: It’s starting to look like a cello! 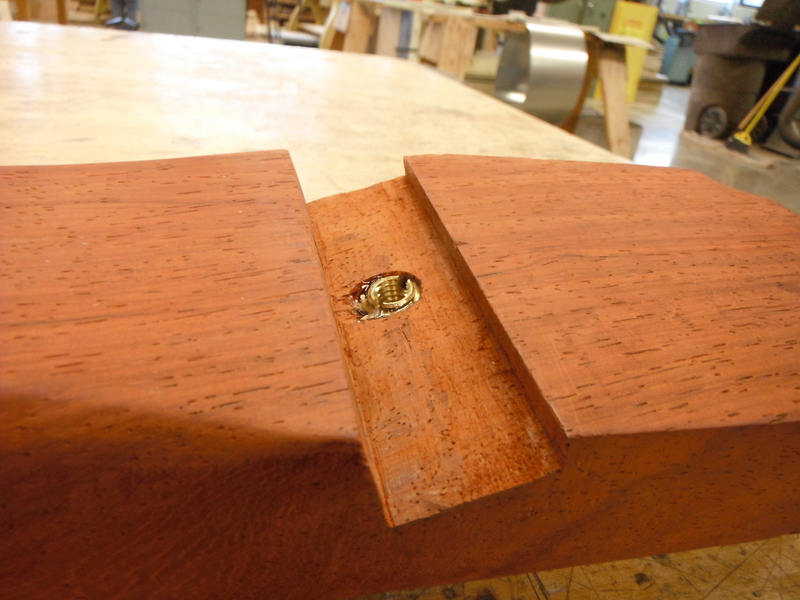 The screws that you see in the pad-like ends are recycled from pianos. Detail of the bridge sitting on its line. It is left unsecured, like the bridge on any acoustic string instrument. 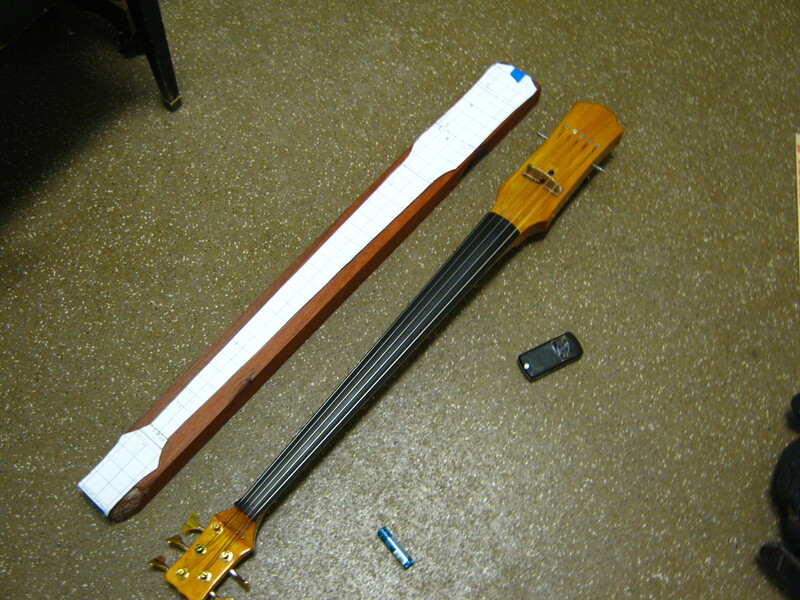 Body of the electric cello. Note show significantly the color of the body has changed since it was first planed! Newly installed nut. It is ebony like the fingerboard. These are the holes for the strings to pass through. They’re drilled at 1/8″, which is small enough that the nut on the end of the strings can’t pass through. 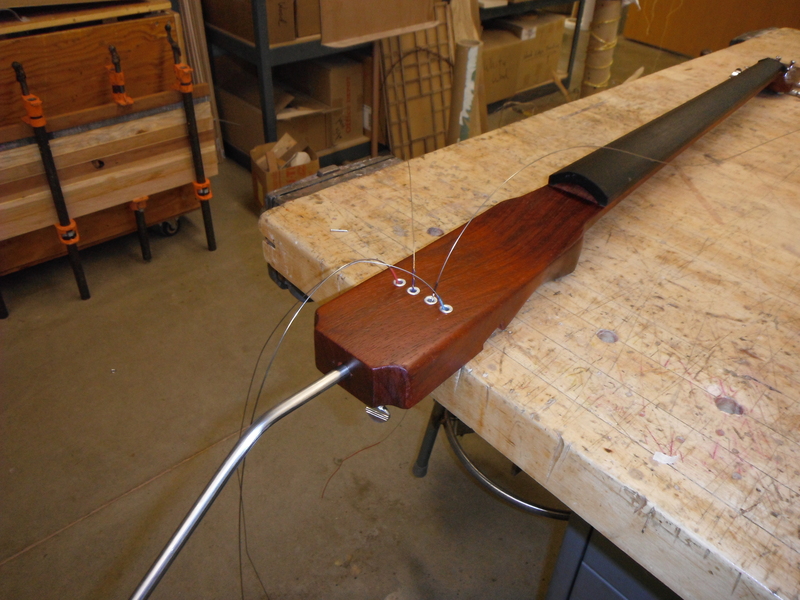 I later put in four grommets to the face so that the tension of the string doesn’t eventually cut through the wood. You can see the four Fender electric bass tuners above…just waiting to be installed. Holes are now drilled for the tuning pegs. Also I wrapped the fingerboard/neck with masking tape in preparation for the varnish. Bill starting to drill the hole for the endpin. 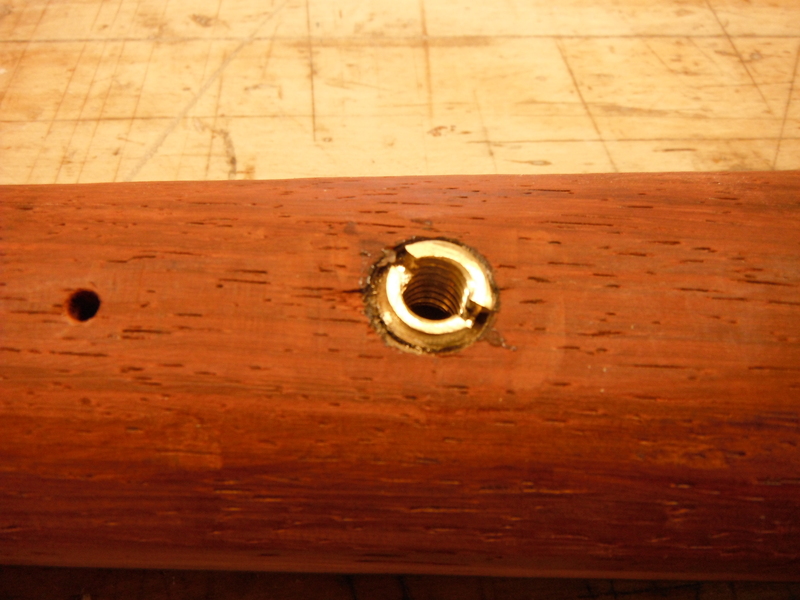 The endpin will be inserted into the hole on the bottom of the instrument and then there will be a screw that can tighten it down, to make it secure. 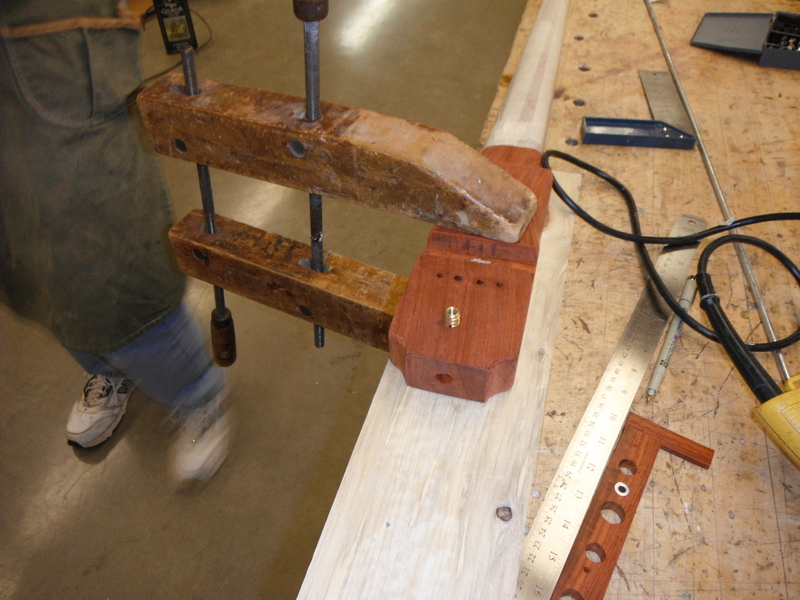 I’m about to drill and place the inset screw piece, that is the gold piece you see sitting on top of the cello. Fun fact: to the right you can see the scrap wood on which I practiced using the drill. The wood got so much darker when it was varnished. It is so lovely. 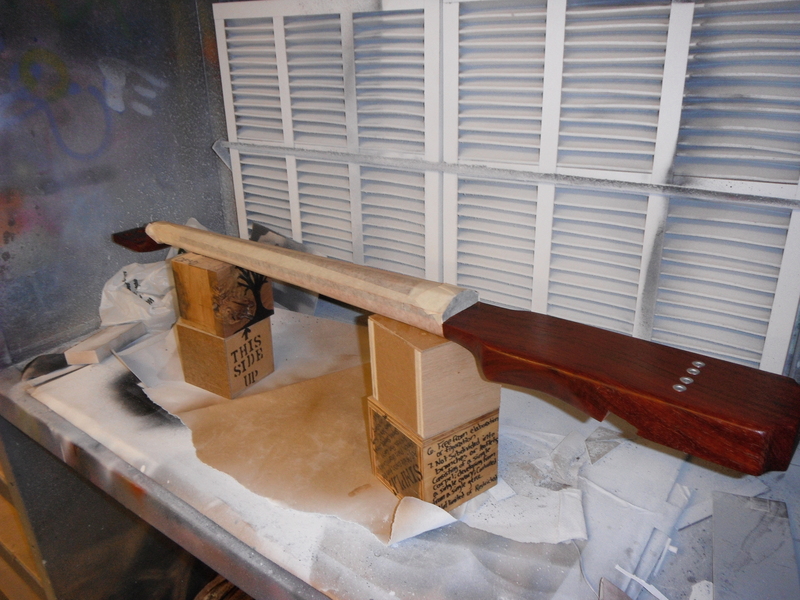 Here it is sitting in the spray booth. 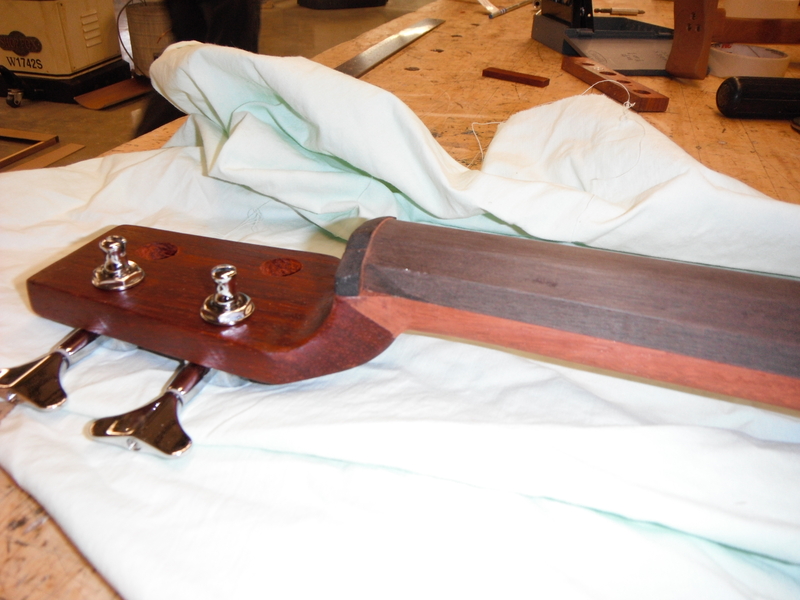 Starting to install the tuning pegs. It was so exciting to take the masking tape off after the varnish! Almost like christmas morning. 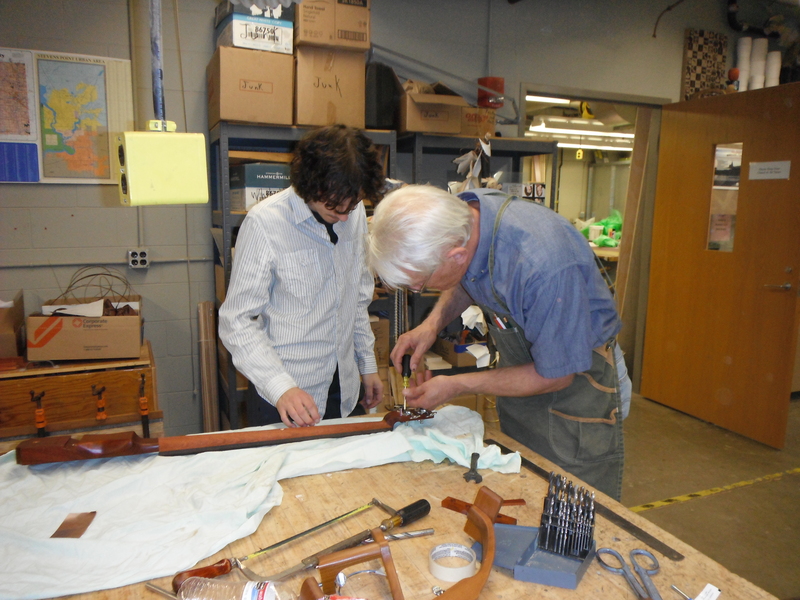 Bill McKee and Luke Ringelstetter helping to screw in the tuning pegs. Putting on the strings! It is almost officially a musical instrument. You can see my makeshift end pin, I am a wood worker, not a metal worker. Therefore my attempt at an end pin was really bad…later it got replaced with one that Dr. Tim made. Anna Huemann and I play the Vivaldi cello duet for the first run of the electric cello! I am using my regular bow, and am plugged into a guitar amp. My cello professor, Dr. Leviton, was kind enough to give me some of his extra strings. 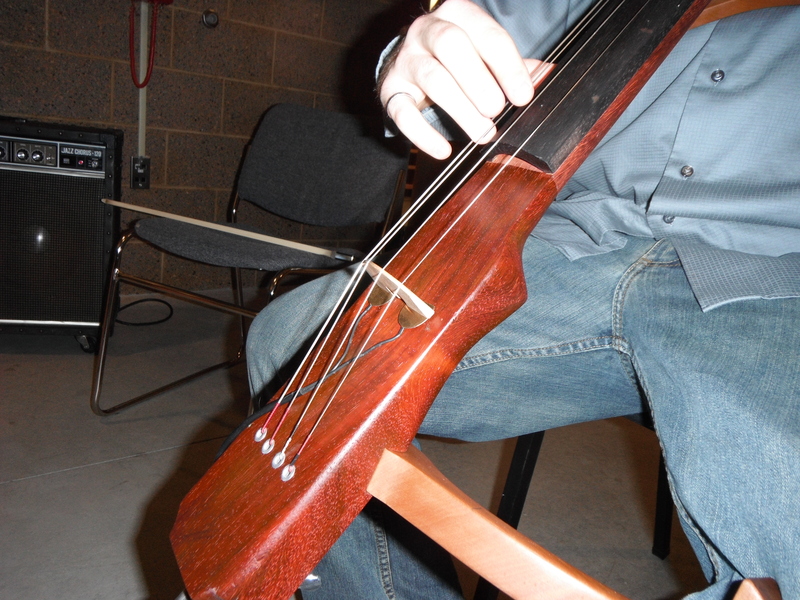 The electric cello. This is after the end of the semester, playing it for my grandparents in Kennebunk Maine. 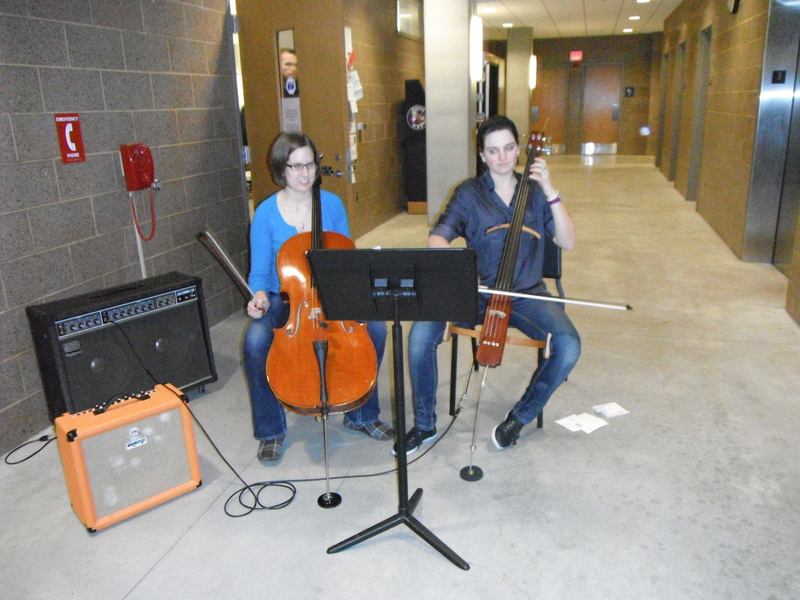 I traveled with the cello through the airports and back to New Hampshire at the end of the school year. For transport I put the end pin, chest piece, and knee piece into my check bag and then put the stick into a rifle case and carried it onto the airplane. Surprisingly I didn’t even get questioned at airport security! Not surprisingly I got a whole lot of weird looks from people in the terminal. 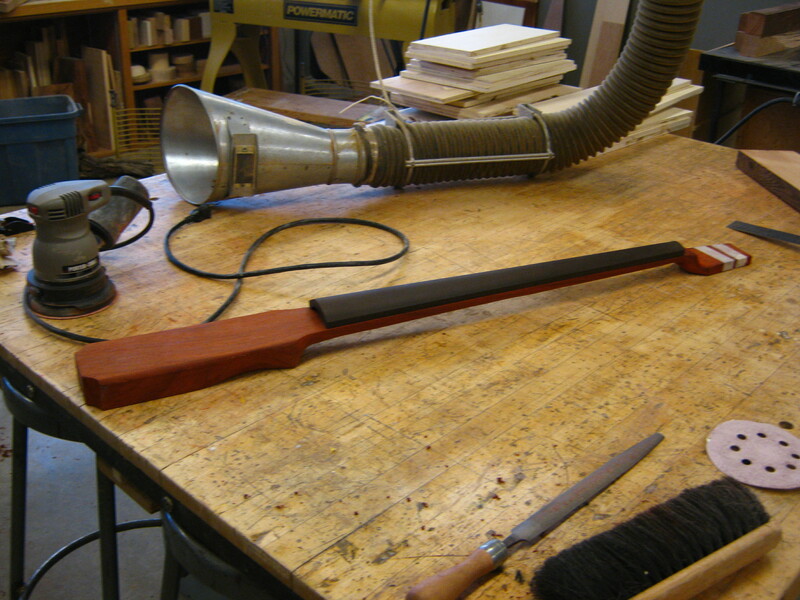 I used this instrument during my summer job at the Appalachian Mountain Club. It was small enough that I could store it in limited space, and my tiny Peeve Bass amp served as a table next to my bunk. On my way back to Wisconsin for Semester I 2011 I was sitting in the Detroit airport with my cello leaning on my chair. I shifted and the cello fell over, almost in slow motion. I bent down to pick it up only to find that the whole head had snapped off! I discreetly slipped the broken scroll into my carry on and then sat back down, trying not to let anyone notice what just happened, blinking tears out of my eyes. I didn’t even asses the damage until I got to my Wisconsin apartment. 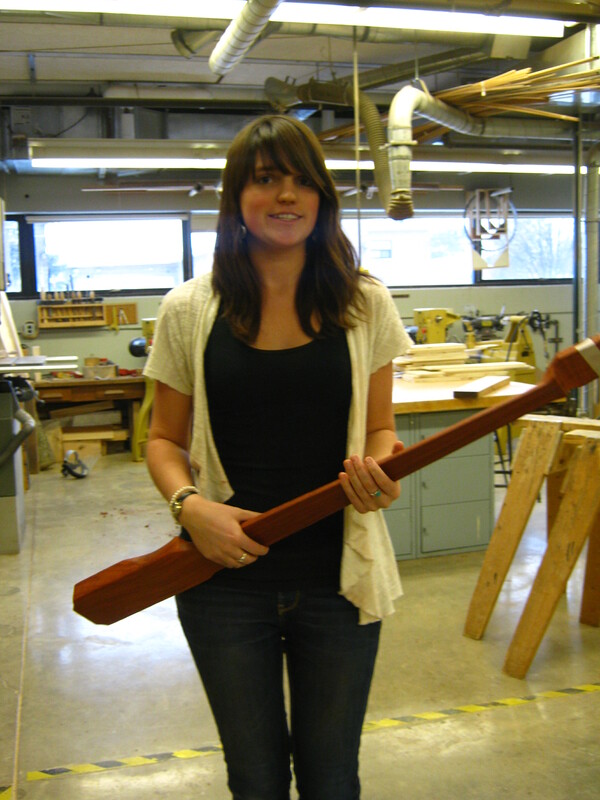 I took the stick back into the UWSP wood shop and that is where it currently sits. We epoxied the two parts back together and I carved a special piece that was then glued onto the weaken connection. Now the cello is fully functional, stable, and beautiful as always. If you have any questions or feedback please feel free to comment here or send me an email! Wow . Wonderful. I made a concept Spanish/Classical guitar a few years back out of a piece of door frame and some unknown railway sleeper wood. The design is very similar to yours. Well done! Thank you Alvin, it was a lot of fun! I would love to see your guitar! Would it be possible for me to get the paper plans that you traced so that I can build one? Hi Wyatt, I actually don’t have those plans anymore. I have been meaning to draw them up again because so many people ask. I will try to do that soon!